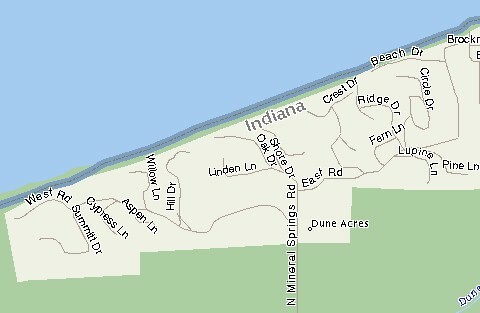 Dune Acres is a quaint secluded community on Lake Michigan, surrounded by the Indiana Dunes National Lake Shore. Nearby highways and the South Shore Line commuter train make us conveniently accessible to Chicago, South Bend, and nearby shopping, recreation and cultural areas. A Security Officer monitors all traffic into and out of town. A sand beach of Lake Michigan runs along the entire north side of Town, while the southern edge contains nationally significant dunelands and wetlands habitats. To locate property listed for sale in Dune Acres, click here. The Property Search page from the Greater Northwest Indiana Association of Realtors will come up. Check the property types box(es) for "Residential" and/or "Vacant Land." Scroll down to subdivisions and enter "Dune Acres." Then click "Submit" in the box near the top on the right side. Street signs are at all intersections. House addresses are numbered, beginning at the start of the street, with odd numbers on the left side of the street and even numbers on the right side. Where a street forms a "T," all odd numbered addresses are on the left of the "T," and all even numbered addresses are on the right of the "T."